"But Where are Your Children?" It is time to pass the torch of remembrance. In honour of their parents, Polish victims and survivors of World War Two, the children have come together to keep the memory of their parents' odyssey alive. THE KITCHENER, ONTARIO, CANADA GATHERING OF THE GENERATIONS WAS HELD ON THE WEEKEND OF MAY 5/6, 2007 AT THE ROYAL CANADIAN LEGION - POLISH VETERANS' HALL. THE TORONTO, ONTARIO, CANADA GATHERING WAS HELD ON SUNDAY, OCTOBER 21, 2007 AT THE POLISH COMBATANTS' HALL, 206 BEVERLEY ST. Planned with the second generation in mind by fellow members of the second generation, the events are informal and conducted in the English language. The children and grandchildren of the Polish survivors, both veteran and civilian, will trade stories and take advantage of the event to learn a bit of the history of the varied Polish experience during World War Two through displays of memorabilia, text and photo life histories and visual displays of rare WW2 film footage. The living survivors are all invited to attend as the honoured guests of their children. They will be able to share their first hand experiences with us and we, in turn, have set aside a portion of the program to pay tribute to them and to the survivors and victims who are no longer with us. For further information please call Henry Sokolowski at 905-569-0642 or e-mail hsokol@rogers.com. For many years after the war Polish soldiers, who had fought alongside the British and Canadians during World War Two, were unwelcome in Soviet-dominated Poland. This is not a huge surprise as the Poles, who understood the ugly reality of Soviet Communism, were rabidly anti-Soviet. As the war wound down and in the immediate post-war period, the British encouraged the Poles to return home. The Poles however, did not want to return to a Soviet dominated state. Hundreds of thousands remained in Britain, Italy, Germany and elsewhere and the problem of what to do with the Poles created a tremendous, raging debate over their future. Many were given the option of emigrating to Canada, Australia or elsewhere. However, within the Commonwealth, they were not allowed free movement, which they may have expected after their service as loyal Allies of the British throughout the war, but instead, they had to submit to a two-year labour contract, mostly on farms, before they were given their freedom. This was in effect, a form of forced labour, the very kind of treatment they had spent the war years fighting against. Furthermore, a stay on a prairie farm during the winter, with hard work, poor shelter and insufficient food, was ironically, almost identical to the conditions they thought they had left behind in Siberia. 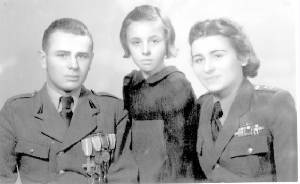 The first Polish veterans allowed to immigrate to Canada, arrived in 1946 aboard the SS Sea Robin and SS Sea Snipe. Halifax... A happy queue of beribboned Polish war veterans marched off a big transport early Tuesday onto the Canadian soil which has adopted them. This was the first draft of 4,000 Polish soldiers who fought alongside the Canadians in the Mediterranean theatre and recently were selected for farm work preferring this rather than return to their own country. Several hundred will go to Alberta." Winnipeg... Three hundred and fifty Poles, veterans of the 8th Army brought to Canada under an immigration scheme which calls for 4,000 to settle here, arrived in Winnipeg Friday to be greeted by score of Polish-Canadians living in this district. A brother met a sister he had not seen for 25 years. A grey-haired woman flitted from one to another seeking one from the village she had left 22 years ago, and the soldiers thumbed through worn dictionaries to find words to tell of the vastness of their new country and the plentitude of food. At Lethbridge, 150 Polish veterans were unpacking their belongings and finding their bearings in guards quarters at the Lethbridge prisoner-of-war camp Saturday. They will be distributed to district farmers within a few days." Montreal... A second contingent of 1,500 Polish immigrants will arrive in Halifax Saturday, aboard the steamship Sea Snipe, the C.N.R. announced Monday. Special trains will carry the former Polish soldiers to Ontario and the west. Winnipeg will get 200, Lethbridge 150, Edmonton 100, Chilliwack, B.C. 100. Last week, a first contingent of 1,700 arrived aboard the Sea Robin and are now being distributed to farms. The plan calls for a total of 4,000 to take up farm work in various parts of the dominion." "Halifax... On the second leg of their journey to new homes in Canada, 1185 Polish veterans who arrived in Halifax on the transport Sea Snipe, were on special trains Monday bearing them to distributing centres across the country from which they will be allocated to Canadian farms. Of the 4,000 hand-picked farmer veterans about 2,900 now have arrived in Canada. The remaining 1,100, who will leave from Britain, are not expected to arrive until next spring. Most of the 1,700 who made up the first contingent which arrived in Halifax about two weeks ago already have been placed on farms." A fear of foreigners, mostly due to ignorance and the general attitude of the times, fueled the anti-Polonism which is illustrated in the "plan." Ottawa... Plans have been completed for the handling in Canada of the Polish soldiers who are coming to take over the jobs on Canadian farms. Most of these coming are the so-called London Poles who fought with the Canadians in Italy and who do not wish to return to their homeland. The first 1,700 arrived in Halifax Tuesday, and 300 will reach Lethbridge Monday for Alberta farms. There is what might be called a five point plan for handling them. 4. Encourage them to mix with Canadians. 5. Go slow in forming Polish societies. These Poles are going to eight provinces, mainly as agricultural workers. So far Prince Edward Island has not asked for any (N.B. In 1946, Newfoundland was still independent of Canada). The first thing, authorities here say, is to make sure these people learn English. 'We want them made into Canadians in the quickest possible time,' one official pointed out. Then if entertainment facilities are provided, these men are not going to brood or espouse nationalistic causes in company with other Poles. Some propaganda has been spread among these so-called London Poles, indicating they are to be the nucleus of an army to fight the Russians in a couple of years, and therefore this is the only place for the army to wait in the meantime. The Canadian Government intends to knock that theory into a cocked hat. The Poles are coming here to become good Canadians. In the past, authorities say it has been found that among Canadians of foreign birth much of the trouble develops when not understanding English and having no place to go, they crowd into Polish halls, and Polish societies. Such societies are considered all right, if the Poles have been in Canada sometime and have developed a sense of balance. 'But we don't want these newcomers brooding over Poland's troubles,' said an official. 'We want them to become Canadians and to forget all Eurpoes's troubles, if they can.'" The first event in the series was held in London, Ontario on October 21, 2006. Polish-Canadians from south-western Ontario (and two from neighbouring states) attended.